For a fancy French breakfast, serve up some crepes! The batter for these thin pancakes can be mixed up in a blender in a flash. 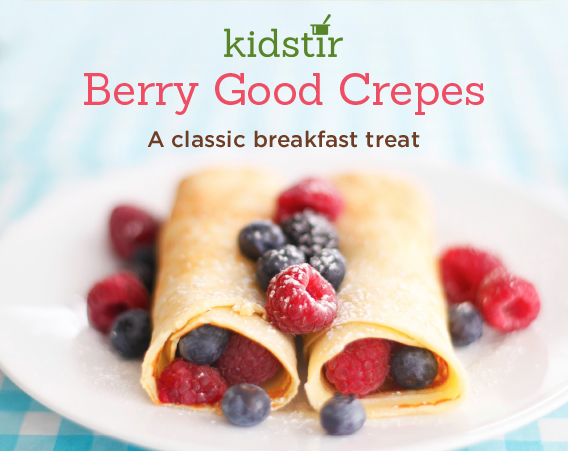 Roll them up with fresh berries and sprinkle with confectioners' sugar. 1. Place the milk, eggs, melted butter, sugar, vanilla, salt, and flour into a blender. Blend until the batter is smooth. 2. Melt a small of pat of butter in a frying pan over medium-low heat. 3. Pour about 1/4 cup batter into the pan. Turn the pan from side to side to make an even circle. 4. Cook the crepe for about 1 to 2 minutes, or until lightly browned. Then flip it over with a spatula and cook the other side for 1 to 2 more minutes. Continue making the crepes until all the batter is used up. 5. Place a crepe on a plate and add a handful of berries to the center. Roll it up and sprinkle with a little confectioners' sugar. Drizzle with a little maple syrup, if you'd like.